Our product Natural Progesterone Spray has been developed from natural progesterone. Like oestrogen, this female hormone belongs to the family of steroid hormones. Naturally produced by women, progesterone is involved in various processes in the body including the menstrual cycle and pregnancy. It is particularly important in preparing for and supporting pregnancy, hence the fall in progesterone levels in the absence of pregnancy, as well as during the menopause. Indeed it is this lack of progesterone which causes the characteristic symptoms of menopause, interfering with daily life and general well-being. 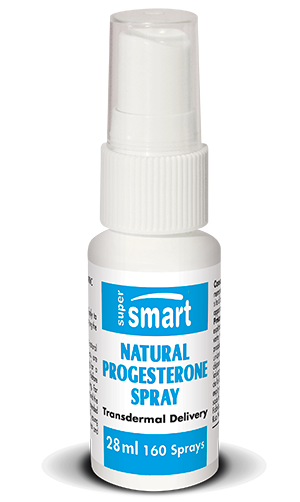 The product Natural Progesterone Spray has been specifically formulated to counter these effects, delivering natural progesterone in an easy-to-use, practical form. Hormone balance is essential in order for the body to function normally; when it is disturbed, hormone dysregulation can occur, producing health complications. Progesterone deficiency can provoke such imbalances which can then manifest as various hormone problems. Indeed, a lack of progesterone can cause premenstrual symptoms as well as those typical of the menopause. These include hot flushes, night sweats and mood swings. Other factors may be responsible for hormone dysregulation as is the case, for example, with amenorrhea or absence of periods, and fertility problems. Natural progesterone offers a therapeutic solution to symptoms associated with the menopause, premenstrual syndrome and late pregnancy. In fact, the use of natural progesterone has produced positive results in treating infertility in women, as well as in relieving symptoms associated with amenorrhea and menopause. In addition, natural progesterone has been shown to have a protective effect against the side-effects of hormone replacement therapy (HRT). Natural Progesterone Spray is a high quality formulation containing natural progesterone in a vitamin E-enriched liposome base. It is produced using a safe, heat-free manufacturing process in order to prevent damage to the delicate structure of the natural molecules. Natural Progesterone Spray is the product of choice for combatting age-related progesterone deficiency and associated oestrogen dominance. Quick and easy to use, this product is applied directly to the skin. It provides a measured, 6mg dose of natural progesterone per spray. This precise dosing method is sometimes preferred to the use of natural progesterone creams. Between one and five sprays a day is the recommended dose for this product. It is advisable to change the application site over the course of a month. These recommendations can be adapted according to your needs and the advice of your therapist. Each bottle contains 960 mg natural progesterone (160 sprays), providing between one and four months' use. Each spray contains 6 mg natural progesterone. Ingredients : caprylic/capric triglycerides, ethyl alcohol, USP progesterone/vitamin E.
Recommended use : Apply 1-5 sprays daily to the skin, varying the site of application over the course of the month. Menstruating or peri-menopausal women should start on days 12-15 of their menstrual cycle and stop on day 26 (counting from day 1 of their period). Post-menopausal women, or those who have had a hysterectomy, can alternate two weeks' use with two weeks' abstinence, and repeat to mimic their pre-menopausal cycle.